Written by the founder of DumpAnalysis.org this book is not about bugs or debugging techniques but about background knowledge everyone needs to start experimenting with x64 WinDbg, learn from practical experience and read other advanced debugging books. Solid understanding of fundamentals like pointers is needed to analyze stack traces beyond !analyze -v and lmv WinDbg commands. 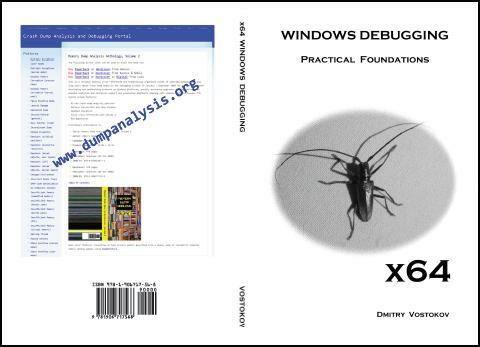 This is the book to help technical support and escalation engineers and Windows software testers without the knowledge of assembly language to master necessary prerequisites to understand and start debugging and crash dump analysis on x64 Windows platforms. It doesn't require any specific knowledge, fills the gap and lowers the learning curve. The book is also useful for software engineers coming from managed code or Java background, engineers coming from non-Wintel environments, Windows C/C++ software engineers without assembly language background, security researchers and beginners learning x64 Windows software disassembling and reverse engineering techniques. This book can also be used as AMD64 and Intel EM64T assembly language and x64 Windows debugging supplement for relevant undergraduate level courses. For someone, who wants to learn these foundations in the context of 32-bit Windows environments there is a separate x86 book (ISBN: 978-1-906717-10-0). However, this book is completely independent from that earlier book and almost every illustration was recreated to reflect x64 architecture and x64 Windows ILP 32-32-64 model (Integer-Long-Pointer).